Knee Pillow Helps You To Have A Better Sleep. If hip problems, lower back and leg pains keep you awake at night, our Knee Pillow could help you to a better night’s sleep. The most common sleeping position is on your side, the Knee Pillow gives gentle cushioning to your knees all night long. Keeping your knees apart allows your legs to stay naturally aligned with your pelvis. 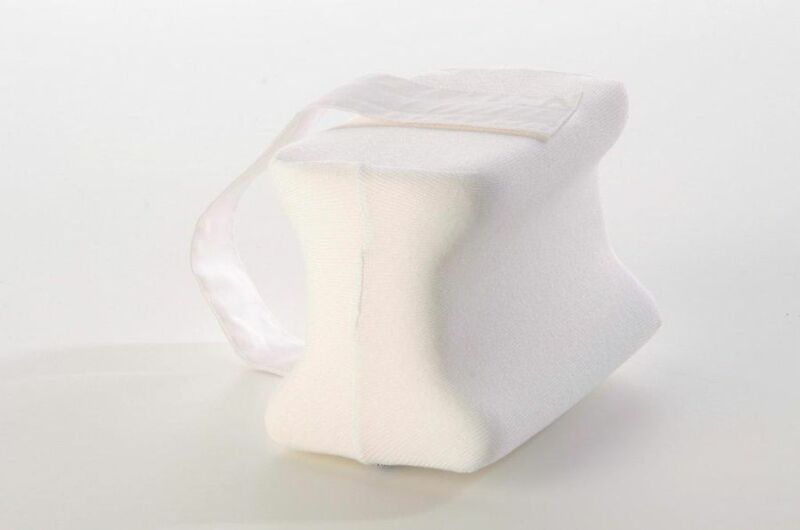 Simply attach the Knee pillow to either leg with the adjustable strap using the velcro fastenings. The removable cover is made from soft poly/cotton mix and is washable. Excellent service, speedy delivery, product 100% satisfactory and very useful after total hip replacement surgery. Would not hesitate to use this company again. I have found this a great improvement on the small roll pillow I was previously using. However, I do feel it would be better if it were not shaped. I find that because of the shaping, the pillow is constantly slipping through my legs from front to back. Maybe I need training ! !